Last year, in response to questions regarding the growing trend of using emojis in commercial messaging, we posted a short, helpuful guide for email marketers, showing which email clients display emojis, and the differences in display across those clients. With such a range of display possibilities (including some that will not display at all), it is important to make sure your message comes across correctly. We hope these tips will help you use emojis intelligently, and the pick the right emoji to convey your message, whether the user is on an Apple, Samsung, or Google product. You are no doubt aware that emojis display differently to other users, but you may not be aware of just how different they are, or how that difference might impact your message. The "Grinning" emoji is one of the worst offenders. A recent study rated the emotional range of each emoji from -5 (most negative) to +5 (most positive). 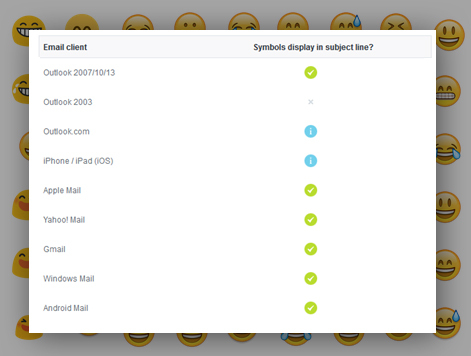 As you can see below, some emojis are more consistent across platforms. We find that it is best to familiarize yourself with these, so that you may choose an emoji which will reliably convey your message. We are in a time of transition, and unfortunately, emojis are not yet accepted universally across email clients. In light of this fact, we recommend using emojis to augment existing sentences, rather than as replacements for words. Problematic use in subject line At Fashion Discounters, We ♥ Fashion! At Fashion Discounters, We ♥ Love Fashion!